Swindon: Wiltshire Malayalee Association’s (WMA) 15th Anniversary (Crystal Jubilee) celebration was formally inaugurated at the Swindon Academy Auditorium during the 2017 Onam festivities by Deputy Mayor Cllr Tom Aditya, who is also the Vice Chairman of the Avon and Somerset Police Scrutiny Panel. WMA President Jaimon Chacko presided over the meeting. Chief Guest Tom Aditya conveyed the Onam message, in which he exhorted the need to wipe out tears of the marginalised and the weaker sections of the community, in order to celebrate Onam in its true spirit. He praised WMA for its 15 years of service and wished the WMA to grow from strength to strength and to dynamically enhance its legacy for future generations. The beauty of the Onam festival lies in its secular fabric, he added. WMA Secretary Saji Mathew, Rev. Fr Saji Neendor, Mr Giji Victor, and Mr George Thomas spoke at the gathering. The recipient of the British Empire Medal from the Wilshire Malayalee community Mr Roy Stephen was honoured at the meeting. Top scorers of the A-level examination and GCSE Ms Roshini Palat and Master Alwin Saji, as well as the UUKMA Boat race men’s and women’s team from Wiltshire, were specially presented with mementoes at the gathering by the chief guest. The Onam celebrations 2017 at Swindon organised by the Wiltshire Malayalee Association (WMA) were really attractive, artistic and was overwhelming with the support and participation of its committed members. The celebration started at 9.30 in the morning with the customary Athapookkalam (floral carpet arrangements) welcoming the mythical King and his beloved subjects. In harmony to thrill the vibrancy of Onam, the children, women and men were engaged with various fun-games and competitions including fashion shows, tug of war and arm-wrestling. The celebration continued with the evocative Onam music by Swindon Stars and the delicious Onasadhya (Onam feast) which added savour, taste and flavour. Following the scrumptious Onasadya, the awesome gathering was geared up to the cultural meeting. 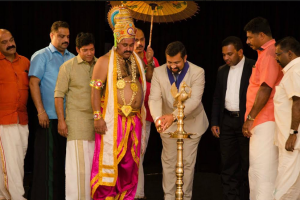 At the cultural gathering, ‘King Mahabali reincarnate’ was accoladed the time-honoured reception with ‘varnakudas’ (colourful umbrellas), ‘chendamelam’ (drums) and music. Much to the amusement of the crowd, the ‘Maveli’ walked through the audience showering blessings and best wishes to all. The women’s dance team led by Raymol Nidhiry, Tinky Tomy, Tessy Aji, Anu Chandra, Ciji Jossy, Julie Mathew, Shiji George and Jini Varghese geared up to tap the enchanting ‘Thiruvathirakali’ (traditional female dance) whilst Erika Nidhiry, Shylaja Unnikrishnan, Stency Roy, Roshini Palat, Anika Nidhiry, Shalini Unnikrishnan, Alina Vinod, Aleena Saji, Julia George, Sheril Shaju, and Kripa George choreographed four varieties of semi-classical dances on stage captivating the audience. Anaka Byju staged the enthralling Bharathanatyam. Enhancing the joy and verve of the audience Mark Prince, Joel Jose, Rion Rejimon, Beval Jose, Paul Biju, Jaiden Jaimon, Stephan Lenny, Angelo Sony, Max Prince, Jake Martin, Anvi Nair, Merlin Prince, Maria Jossy, Henesa Jossy, Sheril Biju, Jeslit Jaimon, Geona Martin, Mathew Prince, Jaik Aji, Jaik Saji, Jeo Jaimon and Elbin Joseph put together three sizzling cinematic salsas. Rajesh Pooparayil, and Swindon stars team melodiously brought music to the gathering. Fusion dance by Angel Sony, Jiya Mathew, Freya Roju and Hannah Jossy choreographed by Aleena Saji and Sheril Shaju also attracted the attention of the audience. Vanchipattu (the boat-race group songs), other dances and songs also beautifully adjoined the rhythm of the programmes. Prizes and mementoes to the competition winners were distributed at the close of the cultural meeting by Cllr Tom Aditya. The celebrations came to close with evening refreshments. Arrangements for the Swindon Onam celebrations were done under the leadership of the committee members and enthusiastic volunteers. The photo coverage of the event was undertaken by Arundev and Rajesh Nadepilly. As the curtain fall to this year’s WMA Onam celebrations, once again there was a huge cheer of approval amongst all enthusiastic participants for holding another feast of tradition and friendly cheer. WMA is planning to hold year-round programmes to celebrate their crystal jubilee festivities as a colourful display of fellowship and fraternity.